Click to download the 2017 California Driver Handbook. Almost every person who was either born or raised in California grows up embracing the concept of driving. Living in one of the areas outside of the densely-populated downtown area of Los Angeles makes owning and driving a car a necessity as much as a way of life for mobility to work, school, or just getting around town. The steps for getting a driver’s license can be lengthy and quite involved, but they are comprehensive to ensure that all drivers know what to expect via the “rules of the road” that are aimed at ensuring safety and enjoyment for all. For the driver’s license application, Californians can study for and apply for a provisional permit as early as age 15-1/2. For the first 12 months as a provisional driver license holder, drivers must adhere to several restrictions, such as permissible ages of passengers and restrictions of time of day when one can drive. Provisional restrictions end at age 18, and new drivers over age 18 are subject only to the basic licensing requirements, including the knowledge test, vision test, driving test, birthdate and legal presence verifications, and fees. With the existing car culture, it’s not astonishing that there are 32 million cars in a state populated by 39.1 million people. This 2015 data means that only about 7 million or 17 percent— the same percentage of residents aged 0-15— do not own a vehicle. Meanwhile, in the global south, driving yourself around is not the norm and owning any type of vehicle may symbolize that one is relatively well-off. There are also different types of public transportation that cater to residents of different topography so driving is not necessarily a way of life. In the Philippines for example, modes of land transportation are buses, trains, jeepneys, tricycles, pedicab, FX, and other more creative forms of transportation such as habal-habal (passenger motorcycle). Jobs also do not typically require a driver’s license unless you are applying as a company or family driver. But since moving to a different country requires one to adapt, we have listed several tips and tricks about driving in the state of California. If driving skill was insignificant in your home country, you must at least be open to learning this skill. It is sometimes the case that transplants (especially when you’re at an age where you’re just set in your ways) cannot wrap their heads around acquiring this skill, and that’s alright. Driving may be commonly associated with freedom and independence, but if you are resourceful it is not impossible to go around the Golden State without a car. 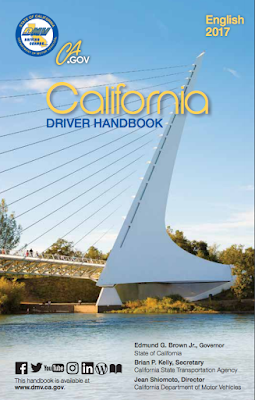 To drive in California, the first step is to get a copy of the latest California Driver Handbook and study it. The second step is to schedule the knowledge test and select a DMV testing venue. Make sure to complete the application form or DL 44 and to bring required documents or valid and acceptable identification such as your green card, California ID, and Social Security card. There is also a $33 application fee. Part of the application process is a vision test, taking your picture for the license, and fingerprinting. Passing the knowledge test is the third step. To get an idea about how the exam is administered, sample test questions are available at the official DMV site. Search YouTube and you will also find the different versions of the test that will help you review. After passing the knowledge exam, the fourth step is to choose an instructor who can teach and supervise you as you practice for the driving test. California high schools include driving in their curriculum, but if you moved here after high school, you can either enroll in a driving school or ask one of your family or friends who has a license to commit to teaching you. Practicing is the fifth step. If you have been driving in your home country, this is an opportunity to unlearn all the unacceptable driving habits. Having gone home to the Philippines earlier this year, we realized how the connotation of chaotic driving conditions in Asia came to be. In the absence of traffic lights and standard enforcement, it dawned on us that driving in Manila, for example, is more about gut and calculation rather than following traffic rules and regulation. This is probably why veteran drivers from back home have a more difficult time passing the behind-the-wheel test. Some of the basic things to remember when practicing is that both hands should grip the steering wheel, and to use the acronym SMOG when changing lanes (Signal, Mirror, Over the shoulder— yes, turn all the way around to see if you’re clear to make a lane change—then Go). Crosswalks or pedestrian lanes are also sacred and pedestrian safety is a priority. Also remember that if you do not feel safe about turning right on a red light, you are not legally bound to do so. as well as the list of critical driving errors. driving test. After selecting the DMV office where you want to take the exam, drive by the office after hours so that you can practice driving around the area on roads that testers are likely to use as routes for the test. If you want to get an idea about how tests are administered, several YouTubers have documented and shared their experiences. You may also check the DMV YouTube channel where they have posted several videos about the driving test. Be sure to follow DMV recommendations about the condition in which the car you are using for the driving test should be. This includes ensuring that all seat belts, turn signals, lights, windows, indicators, and the parking brake function properly. Finally, the last and seventh step is to pass your behind-the-wheel test. If you have prepared well, you should be confident. We would suggest that every examinee show total deference to the examiner. Examiners will deduct points for basic safety skills, such as speed limits, following distance, and signaling. Immediate test failure results when the examiner has to intervene for any reason.